May was a busy month. So busy I pretty much forgot to tell you about Zach's birthday. Yup. Mom of the year on this blog. Geesh. Zach turned 14 on May 9th! 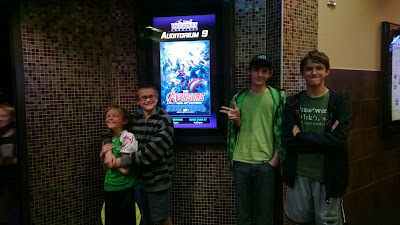 We decided to keep it low key and The Avengers had come out a week earlier (I think). All of us really wanted to see it, so I told Zach he could take one friend. Then I realized that we only have one car and it seats five people. Kurtis volunteered to stay home and watch it another time, so we wouldn't have to rescind the invitation, or buy a mini van. We loved that movie! It was so much fun! After the movie, we came home and had pizza and cup cakes, and opened presents. Sunday, Zach advanced in the youth program of our church from a Deacon to a Teacher. My parents came, Kurtis blessed Zach with more priesthood responsibilities, and we ate steak (except me. Steak is gross. I ate chicken), and had more cake. See, they really loved the show. Kaleb and Riley got him Minecraft toys. I asked if they thought he was too old for those things and they disagreed with me (of course). I guess Zach would disagree with me, too. Money is always an excellent gift for a boy his age. He's been wanting this for awhile now. And this was what he asked for, so of course he's excited. The cake I baked for Sunday. We sang to him, he blew out the candles, and we ate the deliciousness that is whatever kind of cake that was.